Medal presentations 2006 New Zealand Rowing Championships, Lake Karapiro, Waipa District, Waikato. Saturday the 25th of February 2006. Day two of two. Medal presentations 2006 New Zealand Rowing Championships, Lake Karapiro, Waipa District, Waikato. Friday the 24th of February 2006. Day one of two. 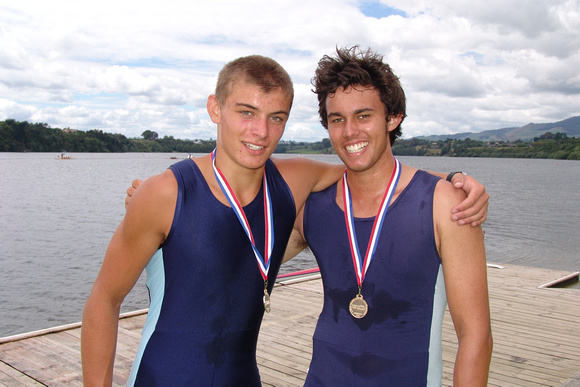 Cambridge lads Jono Leigh and Matthew Glenn from the Cambridge Rowing Club, gold medal winners in the Men’s Under 19 Double Sculls, at the 2006 North Island Rowing Championships at Karapiro Hydro Lake.